Outpatient clinics provide a wide variety of services to patients including everything from the treatment of chronic conditions, to diagnostic tests, and even minor surgery. Often this type of patient care requires post visit follow up. Traditionally, providers have had to choose between two less than satisfactory follow-up methods, asking patients to come to the office for a follow-up visit, or providing follow-up care over the phone. A return visit is inconvenient for the patient and inefficient for the practice, but the provider is reimbursed. A phone call is certainly more convenient and efficient, but generally not reimbursable. 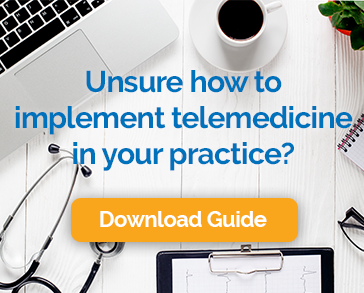 Fortunately, there’s a third option that is easy on patients and practices alike, while ensuring that the provider is paid for the encounter – telemedicine. Here are a few ways that outpatient clinics are leveraging video visits to boost revenue, delight customers, and make better use of office resources. Medication checks are important to good patient outcomes, but making a special visit to the office for a 10 to 15-minute conversation can seem onerous to patients, causing them to cancel or give up on careful medication management. Many providers find that offering video visits instead makes it easier for patients to remain involved in their care and get the proper follow-up to ensure their medicines are getting the desired results. Patients with chronic conditions, like hypertension, IBD, or diabetes are dealt a double blow. They have to deal with the symptoms and limitations of their illness, while at the same time managing frequent encounters, sometimes with multiple providers. Telemedicine helps reduce the burden on these patients, making it much easier for them to get the attention they need, while minimizing the time and costs associated with numerous visits. Outpatient clinics often provide services related to lifestyle coaching, helping patients maintain a healthy lifestyle by losing weight, quitting smoking, and becoming more active. Video visits are ideal for the type of counseling patients need to keep on the right track. It is usually not necessary for a patient to return to the office to review test results, so this has traditionally been done over the phone. The lack of reimbursement is an obvious downside to this approach, but it also makes the encounter less personal and makes it more difficult for the provider to determine if the patient really understands the information being conveyed. Video visits using secure, HIPAA compliant telehealth software solve both problems. For outpatient clinics, telemedicine represents the proverbial “hat trick” – practice efficiency, patient convenience and reimbursement. It’s no wonder that clinics across the country are embracing the approach with enthusiasm.